After a last breakfast on the Malecon in Mazatlan it was lots of highway, lots of toll booths, lots of Pemex gas stops, and lots of cold drinks before arriving in Navojoa. More hot highway riding, punctuated by gas stops and cool drinks. At Hermosillio I turn right on to the lesser traveled and far more beautiful roads that lead me to Banamichi. The desert here is mountainous and much more green than along the coast. I smell the rain before I see it falling on the mountains above me. 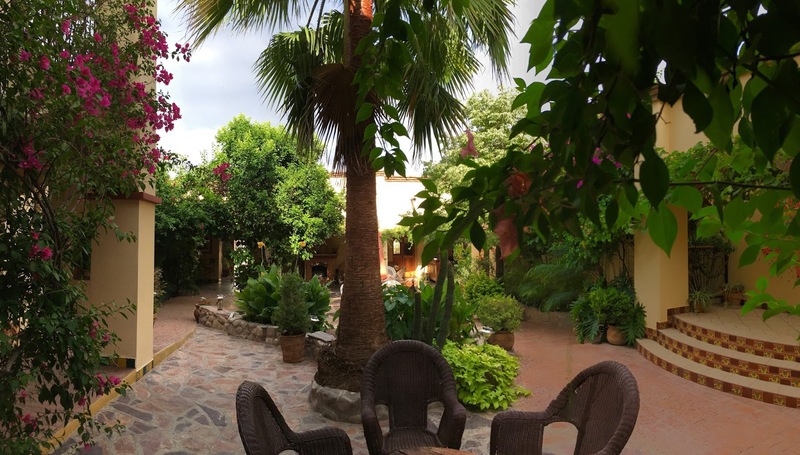 Hotel Los Arcos is an oasis that feels like home, I have stayed here every motorcycle trip I've taken to Mexico. It is hard to leave Hotel Los Arcos, but after a delicious breakfast it was time to go. The road from Banamichi to the border at Naco is a little rough in places, it is also totaly enjoyable. A few shallow water crossings, men riding horses, cows, some churches, and a bobcat ambled across the road in front of me. On my last morning in Mexico this road reminds that I am leaving an authentic and soulful place. After crossing the border I'm too soon on the freeway. Endless rushing interupted only by hurried stops for corporate fast food. I find a hotel surrounded by freeway, streets and parking lots. There is no place here. There is no here here. Between the malls and gas stations I find a restaurant. A simulation of a restaurant in Mexico. It's popular, there is nostalgia for Mexico. But, as the border wall gets higher, the fear grows stronger, people are less likely to experience Mexico and the simulated mexican restaurant becomes more and more boring and superficial. And finding shade is not easy. I roll up under an aloe tree in the parking lot behind a Palm Springs fast food restaurant to have a drink of water. A mexican american guy is the only other soul out in the heat, and he's trimming the trees. We talk about how hot it is. He asks where I've been and I tell him. He asks if it's dangerous, I say no. "On the motorcycle?" "Yeah that's Mexican mud I'm covered in." He asks if he can touch the mud, and he does. Three weeks, 4,260 miles, no problems (the horn which broke in the rain even cured itself).